The Castle & Key is our flagship colour magazine which is published twice a year, in-between our black and white periodical, the Gazette. Suffolk Soldiers Through The Ages: Detailed recreations of the uniforms and equipment of the Suffolk soldier. From 1850 to 1959, his arms, insignia and tactics are explained. The Camera Returns: We return to the locations of Suffolk Regiment photographs to create a 'then and now' comparison. We've been as far as Gibraltar, but closer to home in Stowmarket, Ipswich and Ely. Suffolk Soldiers Remembered: In each edition we remember an individual Suffolk soldier and expand on his service and campaigns in which he served. Some of our research has shown amazing results with Friends members not knowing they were related! 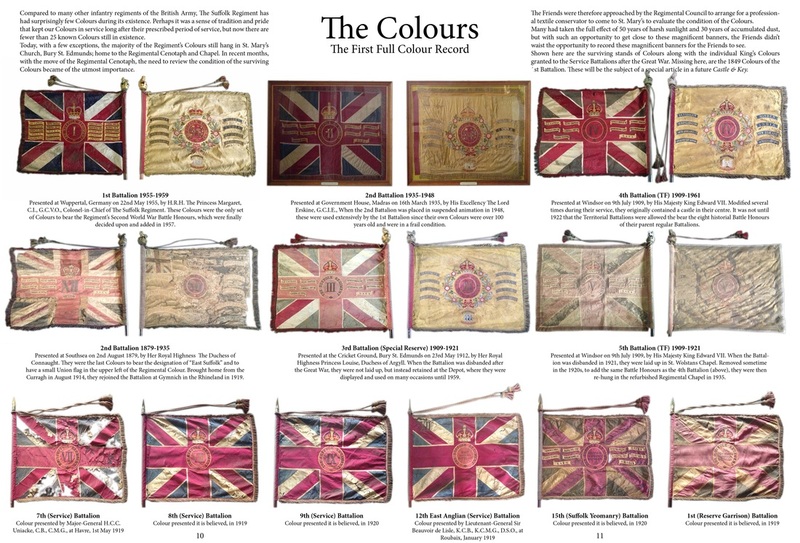 Above: The first full colour record of the Regiment's surviving Colours. 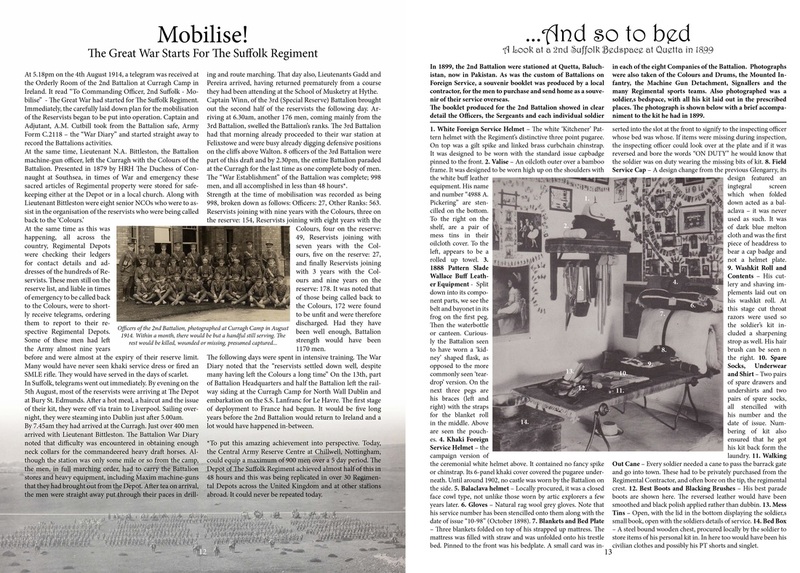 Above: The story of mobilisation for the Great War, and a soldiers bedspace at Quetta in 1899. 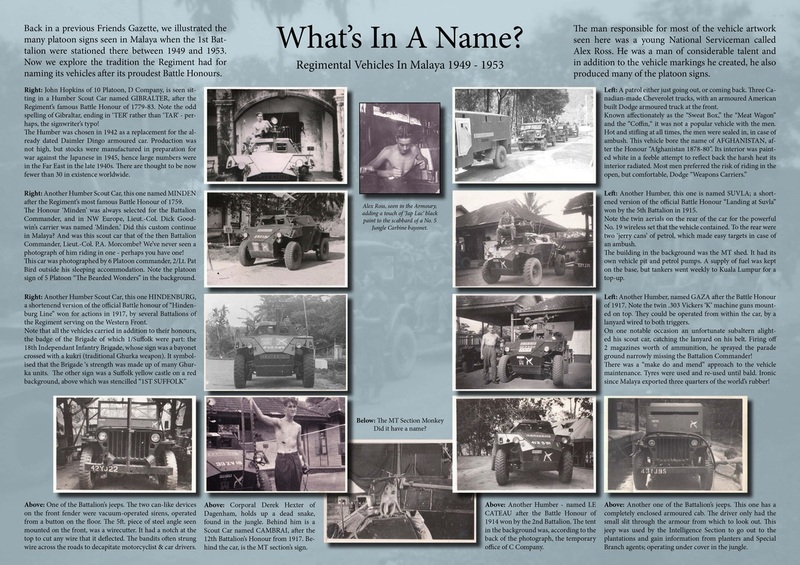 Above: The naming of Regimental vehicles in Malaya, 1949-1953.